A wide variety of paint spraying equipment is available including many differing spray-guns and pressure pots etc.. We are happy to advise on any aspect of paint spraying equipment either for professional, industrial, agricultural or just for DIY use. It is important to have the right match of paint spraying guns for the job. Spray-gun set ups are first priority in achieving that superb finish. 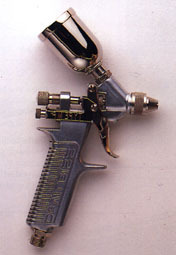 Versatile airbrushes come in many different versions. Single action or double action internal mixes or external gravity feed, side cup, bottom feed or reservoir for touching up or for intricate designs. We stock a complete range of badge brushes suitable for fine art, commercial art, hobby T-shirt/textile, automotive, signs, fingernail painting, photo retouching, taxidermy, cake decorating, ceramics, for use of watercolour, gouache, acrylic, ink, oil, enamel, lacquers, textile, glazes, gesso and vanish. Panel beating, hand & power tools. We are a Sealy stockist and repair agent and as such we stock hand & power tools for panel beating and a huge range of all tools used in the automotive and engineering industry. As we are marketing such a vast range of products it is essential to bear in mind the health, safety and hygiene aspect of all of these products. We therefore stock all kinds of respirators, masks, protective clothing, hand-care creams and cleaners. Health and safety data sheets are supplied with all products were necessary.